Place bread in food processor; pulse until fine crumbs form. In a small bowl, mix breadcrumbs with milk; set aside at least 5 minutes. In a large bowl, combine turkey, scallions, garlic, parsley, egg, 1 1/2 teaspoons salt, 1/2 teaspoon pepper, and breadcrumb mixture; mix gently with a fork. With hands, form mixture into balls, each equal to 2 level tablespoons; arrange in a single layer on a rimmed baking sheet lined with parchment paper. 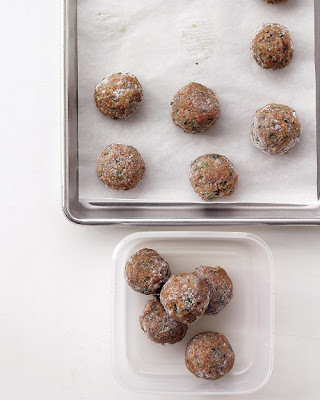 To freeze, place baking sheet with meatballs in the freezer, and freeze for 1 hour to set their shape; transfer frozen meatballs to an airtight container or resealable plastic bag, and freeze for up to 3 months.